Welcome to the web world of Graham Benson. You are probably here because I have been recommended to you, or you searched for a juggler, magician or one of the other skills that I have. I have aimed to make this site simple to use and have all the information you require. At the bottom you find my three main personas. Fuzzy, the first character I came up with, is an all-round family entertainer. If you do not specify a costume it is Fuzzy that will turn up. Secondly you have Angus McLaugh the jester. Tomfoolery and merriment is his order of the day. I have tried to make him authentic, but still will do balloon modelling or anything else that is required. I have even been asked to ride my Penny Farthing as a jester in a parade. Since I have got into sailing as a hobby, I have developed Scurvy, the pirate, not the disease. He is a favourite with the ladies, not sure if it's my rugged good looks or the boots. The last box Circus Skills Workshop takes you to another site: Fuzzy's and Britta's Circus School. The Circus School was set up by myself and Britta (my wife) to promote circus skills within schools. Although it was set up for schools we also cater for other groups like BB, Guides, etc, in fact organisations of any type. We have even been booked for corporate management events. Just click on the photos at the bottom for more information on each individual character. A quick run down on what I do for you: I'm mainly a juggler/magician who can perform shows on stage or street, walkabout, table hopping etc. 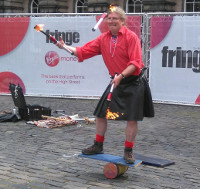 Juggling can also include fire juggling and fire poi (if the venue/event is suitable). I juggle knives, axe and baseball bats. I have even juggled the thing most feared by English, men, women and children: A HAGGIS, a turnip and a potato. (web site built just after Buns night). I also do Balloon Modelling (4 years getting a BA.hon from Glasgow School of Art in sculpture helps), Whip Cracking, Unicycle, Mini Bike, Penny Farthing (great for parades and Victorian days), Workshops with or without Britta. What do I need from you: If you want me to bring my PA, a 13 amp domestic type socket close to the performing area. I now have a steet amp and mic so if necersery I can be self contaied in a field. A suitable changing area would be nice, but at the end of the day I can use my car. Parking close by would be nice, particularly if I'm using fire. But most important: information. The more information I have about your event the better the job I can do. As with the haggis juggling menstioned above I do like to customise my act to suit your event. I'm based in Cumbernuld, why Cumbernuld? Well it's ideally located for getting to Glasgow or E dinburgh and up north to Perth and Aberdeen. Since the new bypass I can even get to Ayeshire with no problems. How far do I travel? I regularly cover from Inverness to Carlisle, and I'm happy to go to most places. One part of the job I like is getting to go to places I would not otherwise go to. What I do not do: Sorry, no fire breathing or eating, tastes horrible and the after effects are not nice. I also do not do private kids' parties ie birthdays or communions.